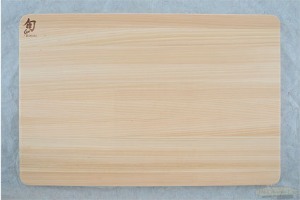 Hinoki boards are used throughout Japan. Hinoki is a cypress that is native to Japan. Its wood and oil are known for their ability to kill bacteria, viruses and fungus. It is also prized for its longevity under the wettest conditions. These properties add to its desirability for use in a kitchen.